Qatar Rail said it had already received the 21 tunnel boring machines (TBMs) assigned for the project and imported from Herrenknecht, a German market leader in mechanised tunnelling technology. Most of the TBMs are currently operational, with Qatar Rail expecting to successfully accomplish the tunnelling phase by the second quarter of 2017. They form circular tunnels through the rock, and can install concrete linings along the drilled sections to reinforce the bored tunnel and stabilise the ground, he added. 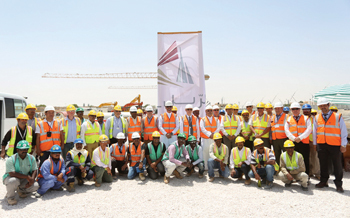 The Doha Metro’s Red Line has launched all its tunnel-boring machines, which are named Lebretha, Al Mayeda, Al Khor, Al Biddaa, Lehwaila, Al Wakra, Msheireb, Doha and Al Zubara. Tunnelling works are progressing according to plan where the total stretch dug by these TBMs reached 11,880 m for both the northern and southern sections. In parallel, the Green Line also launched its six TBMs with an accumulative tunnelling of 6,653 m executed by Al Rayyan, Al Gharrafa, Al Messila, Al Sheehaniya, Leatooriya and Lijmailiya TBMs, while the tunnelling drive recorded 150 m at the Gold Line, which has received its six tunnel-boring machines, namely Lusail, Sharq, Al Sadd, Al Waab, Al Sailiya and Ras bu Abboud (Airport City North).